Holy Rosary Parish was founded by the Dominican Friars in 1913 when they were invited by Bishop Nicholas A. Gallagher to serve the needs of 125 families living in what was then Houston’s south side. At the time, the city had only 82,000 citizens. As soon as the parish was established, work began on a two-story building on land donated by William H. McCarthy. Upon completion, the lower floor was used for the parish church; the upper floor served as the parochial elementary school, conducted by the Dominican Sisters of the Congregation of the Sacred Heart. Beginning with six classrooms and 25 children, the school grew into all eight grades by 1922 and remained open until 1963. 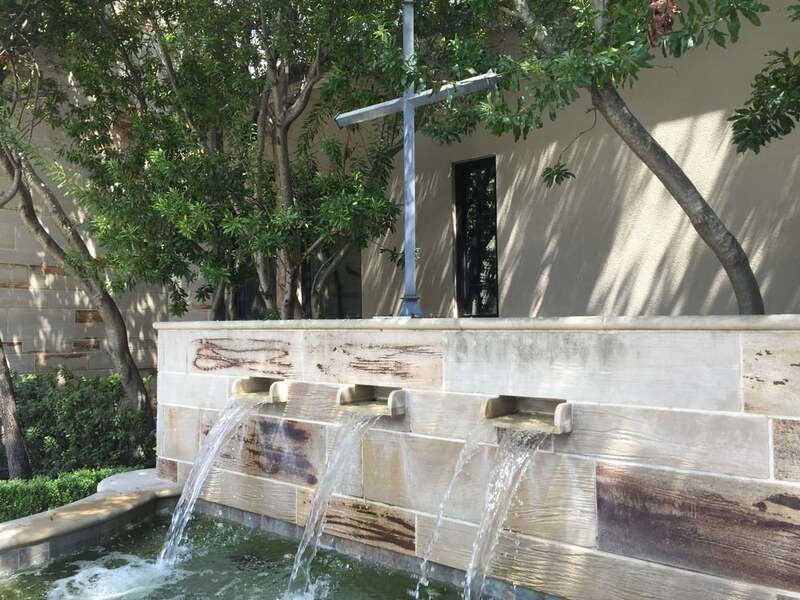 The first Mass was held before construction was complete in a private residence at 3605 Milam Street. The first baptism in the parish was that of Joseph I. Macatee; the first funeral was for George Rick; and the first wedding was that of Charles Giraud and Mary Kittrell. Since its inception, Holy Rosary has served as the physical foundation from which the Dominican Friars have provided spiritual care throughout the city and nurtured the faith of generations of parishioners. Father Raphael A. LaPlante was Holy Rosary’s first pastor. One of his first acts was to organize a chapter of the Holy Name Society. In 1920, Mrs. C. C. Cunningham was the first member of the parish received into the Dominican Third Order. About the same time, the Blessed Virgin’s Sodality was organized for young women. On the third Sunday of each month, these young ladies received Holy Communion as a group. In 1928, the Rosary and Altar Society was formed. Later organizations included the Rosarian Club for young adults and a chapter of the Society of St. Vincent de Paul. 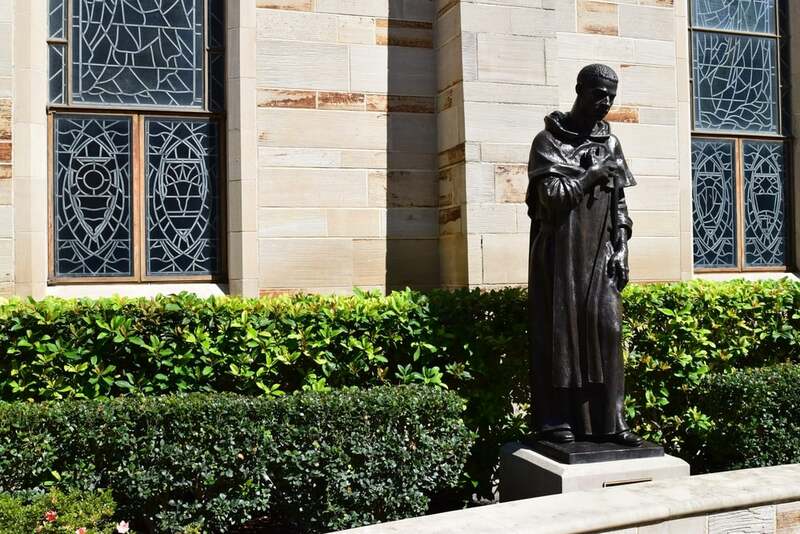 Through the years, the Friars have accomplished a variety of works. Besides providing the sacraments, there has been instruction for converts and religious education, spiritual care of the sisters at St. Agnes Academy and various religious orders, sick calls that have increased with the growth of the medical center, counseling, consolation, and teaching at all levels of education. Since 1913, Houston has been home to over 100 Friars and has fostered dozens of vocations. And the parish itself has been divided several times to form from its members other parishes, including St. Vincent de Paul in 1940. A goal that had always concerned the members of the parish since the parish’s inception was the construction of a permanent church and rectory for Holy Rosary. By 1926, the church had paid down its original debts, and the parish began to save money for a new church. After Father Martin McDermott became the pastor in 1930, he decided that the time had arrived to build. He engaged Maurice J. Sullivan, a respected architect and parishioner, to work on plans for a Gothic structure. Works to Sullivan’s credit in Houston include St. Anne Catholic Church, St. Mary’s Seminary, and several schools and hospitals. Plans were approved by Bishop Christopher B. Byrne and Father Terence S. McDermott, Provincial of the Dominican Province of St. Joseph. Using $79,000 from the parish savings account, the Standard (now Fretz) Construction Company, under Edmund A. Fretz, took charge of the new construction of the church and rectory. Groundbreaking began on September 15, 1932. On February 5, 1933, Bishop Byrne laid the cornerstone for the church before a large congregation. Using materials of the highest quality, the church exterior was built from Bedford stone; the interior was constructed of Texas limestone. A beautiful purple and green slate roof covered the open trusses of the church. The center of attention inside the church was the main altar, quarried near McNeil, Texas. Oswald Lassig performed the intricate carving on all of the altars. The main altar had a canopy of blue velvet trimmed with gold and yellow satin. The tabernacle was bronze; the candlesticks were carved from birch over-laid with gold leaf. The transom above the main entrance was carved in relief, depicting Our Lady of the Rosary. The vestibule was divided from the nave by a screen of wood and mottled glass. The baptistry alcove, divided from the vestibule by a wrought iron grill, contained the stone and copper font from the temporary church. On the feast of St. Albert the Great, November 15, 1933, Bishop Byrne blessed the church. The new church cost $150,000, a very low price due to depression era expenses. Even though many parishioners had suffered from the depression, they gave generously, and in only a few years, the debt of $71,000 was liquidated.